Who wins? Looks like Marvel is setting this up. If his wife and baby died, Hulk wins without question. No fancy high-tech gadgets will save Tony (or the others). Are they going to do covers for Hulk taking on every member of the Illuminati? I know there was some talk about all the covers coming together to make one big picture, but if they could fit Illuminati bashing in there too it would be cool. This could be an awesome battle. 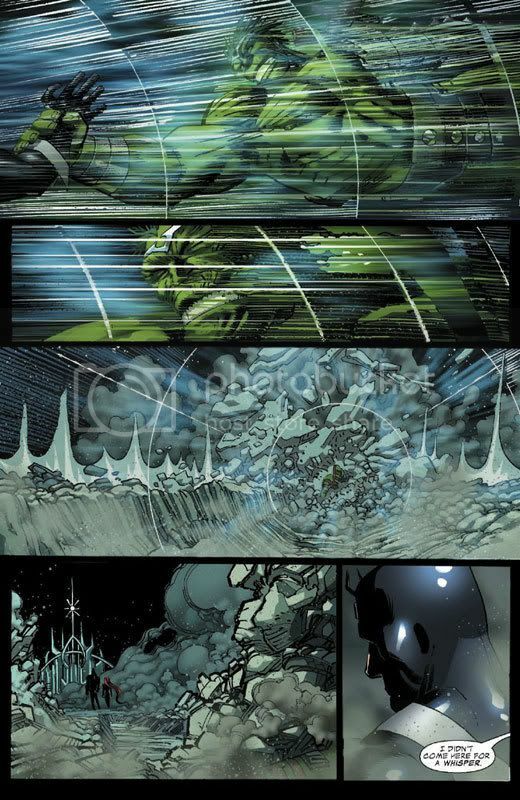 Hulk does have most of the advantages in a physical fight, being that he has nearly limitless amounts of stamina and an ever-rising strength, plsu the fact that he can heal from any of Tony's rockets of any laser cannons and such. I believe that if Tony had a little time to prepare for the fight, he would have a legitemate strategy that could give him the win. He doesnt have to fight Hulk physically, im sure Tony has gadgets to make ur brain shudder and shut down, like the stuff he used on Captain America in Civil war that hit is mind. Hulk is physically most powerful, but his brain isnt the brightest or the strongest, despite being Bruce Banner an all. I think Tony would win. Barely. "This could be an awesome battle. Hulk does have most of the advantages in a physical fight, being that he has nearly limitless amounts of stamina and an ever-rising strength, plsu the fact that he can heal from any of Tony's rockets of any laser cannons and such.I believe that if Tony had a little time to prepare for the fight, he would have a legitemate strategy that could give him the win. He doesnt have to fight Hulk physically, im sure Tony has gadgets to make ur brain shudder and shut down, like the stuff he used on Captain America in Civil war that hit is mind. Hulk is physically most powerful, but his brain isnt the brightest or the strongest, despite being Bruce Banner an all.I think Tony would win. 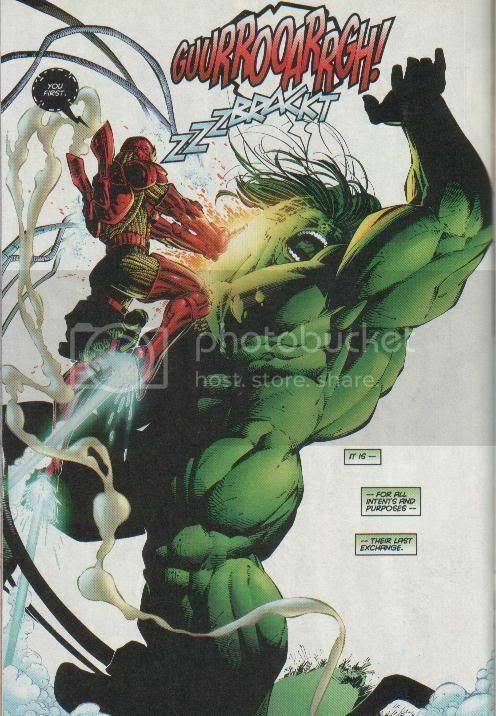 Barely.1"
Both Zzzax and the Leader have tried to take control of or alter Hulk's mind, and it didn't work. Iron Man has no way of winning. 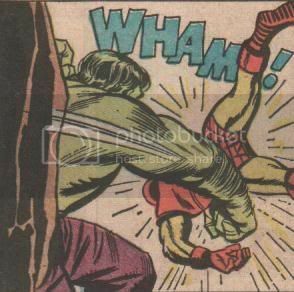 Hulks already beat Iron Man, this is nothing new, in fact he took on Iron Man, Namor, Wonder Man,and Hercules, and was kicking the $#@! out of them and got bored and left. The Big Green Man Wins beats iron man like a red headed step child. I said that if Hulk's wife and child did in fact die in that explosion, Hulk would win. He abuses reality (destroying magic, breaking energy) when he's angry enough, so killing his child and wife would create an unstoppable monster. Just look how he brushed off BB's attack (I know it wasn't full force). However, Iron Man can and has taken him before. 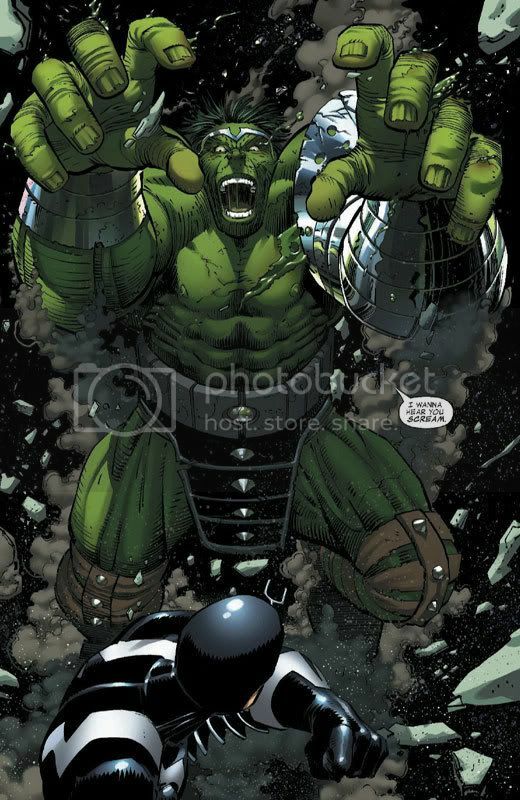 Of course it's World War Hulk so they probably won't have him lose in his own event. hold on now hulk has a wife and kids. Hulk would probably annilate Stark for sending him into space. 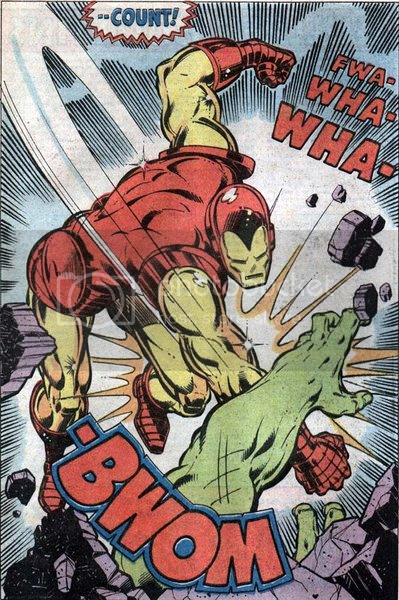 I give Stark credit for his genius and what not, but Hulk is a natural brawler and a improviser when he fights. Besides Hulk has stood against Thor and Hercules and walked away, pounding both of them. Hulk is back and he is very pissed. Besides Stark deserves it. Yup, the Hulk has even taking on Dr. Strange and won, Taking shots from Thor and his hammer, he cant be beat by Iron Man, aint gonna happing. were any of those real, like were they in comics? Hulk vs. Avengers is a fairer fight. "were any of those real, like were they in comics?" Those were all real. Wow, I still remember Incredible Hulk #316. FOUR Avengers against the Hulk. Not a chance. But then it was just the Hulk. I'm pretty sure that was when they mananged to separate Banner and Hulk. Hulk was just pure anger. There wasn't anything to hold him back. There was also no reasoning with him. Iron Mans a lawn jockey. Well I think Ultimate Hulk is significantly stronger than 616 Hulk, or at least Ultimate Admantium is weaker, I dont think 616 Hulk could do that to Wolverine. 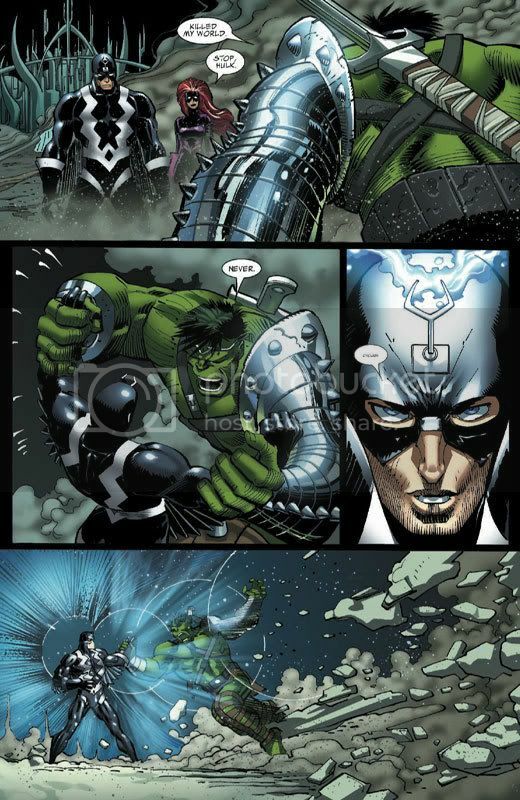 Although I didn't think 616 Hulk could withstand a little of Blackbolt considering that same whisper took Apocalypse down in Black Panther a couple years back. Well seeing as the thread was about Hulk and Iron Man, I don't think Wolverine is much of an issue. Well, he wasn't until you brought him here. Hulk > Wolverine > Iron Man. Anyhoo, it seems like if Hulk could just get his hands around Tony he could squeeze him until his insides swelled out between Hulk's fingers. Got off topic, but the underline message is still there. If Hulk can rip Wolverine in half, he could easily destroy Tony Starks armor. "I thought we were using Wolvie to measure Hulk's strength like: Hulk > Wolverine > Iron Man. Anyhoo, it seems like if Hulk could just get his hands around Tony he could squeeze him until his insides swelled out between Hulk's fingers. " "Got off topic, but the underline message is still there. 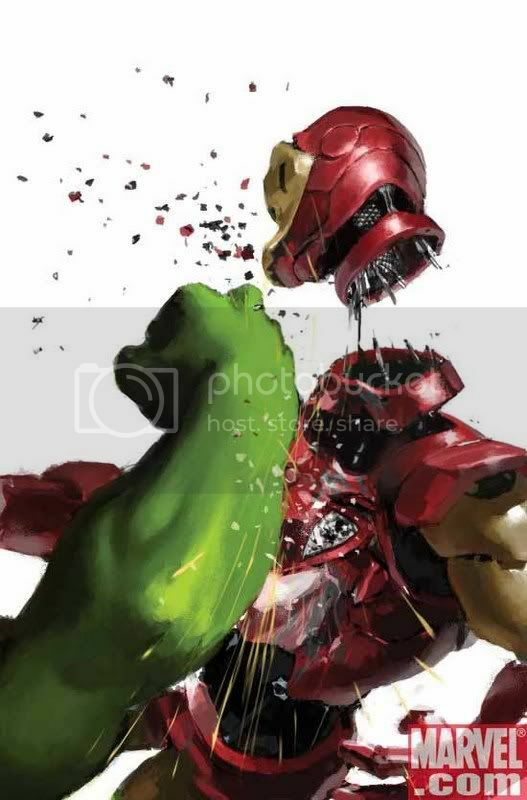 If Hulk can rip Wolverine in half, he could easily destroy Tony Starks armor." Think about it. 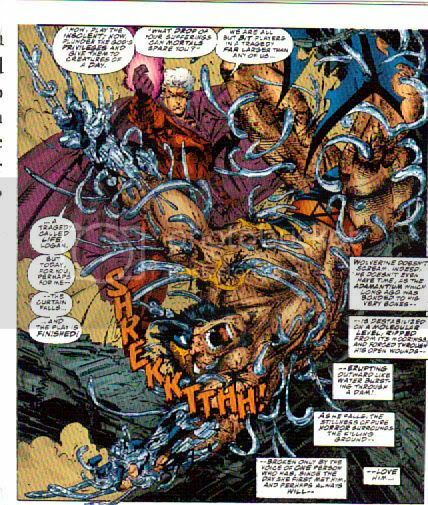 If Wolverine's spine were entirely adamantium, he wouldn't be able to move. For his spine to be flexible it can't be solid metal, so Hulk could have torn it where it wasn't adamantium. Besides, Iron Man has long range weapons and is faster than Wolverine so he wouldn't be caught so easily. In fact, Tony could send a suit an control it from somewhere else, he doesn't even need to be near Hulk to fight him. And who says he only uses one armor? He can control more than one at a time and even let some fight on autopilot. He can have an army of armors fighting Hulk. And seeing as he's already beaten Hulk while using only one armor, I'm sure he can do it with more. So like I said, I'm going with Iron Man unless Hulk's family is dead and he has obscene levels of rage which, judging from the glimpse of his fight with BB, is probably the case. I thought his skeleton was just coated with adamantium. It is, there are no un-coated parts of his spine. Wolverine's entire skeleton is covered with adamantuim. And I'll say it again, the Hulk took on Namor, Thor, Hercules, Iron Man and Wonder Man, and was kicking the $#@! out of em. The only reason he didnt kill them was becouse he got bored and left. Everything you said Buckshot is true, but your adding new dynamics and etting the fight up for Iron Man, who said Tony would send other suits to fight the Hulk? Its Hulk vs.Iron Man. And Hulk wins. I agree. 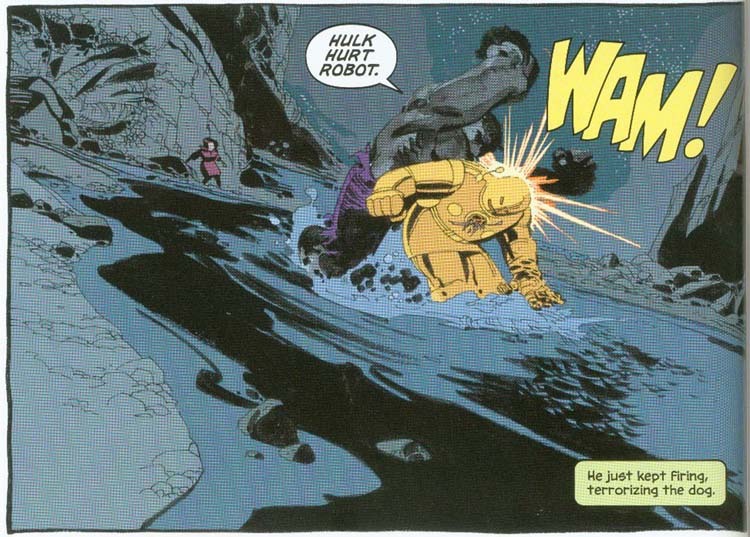 Sure Iron Man can fly around a shoot his repuslser rays but Hulk could just throw a mountain at him or something crazy. Iron Man even had the Hulk buster suit. 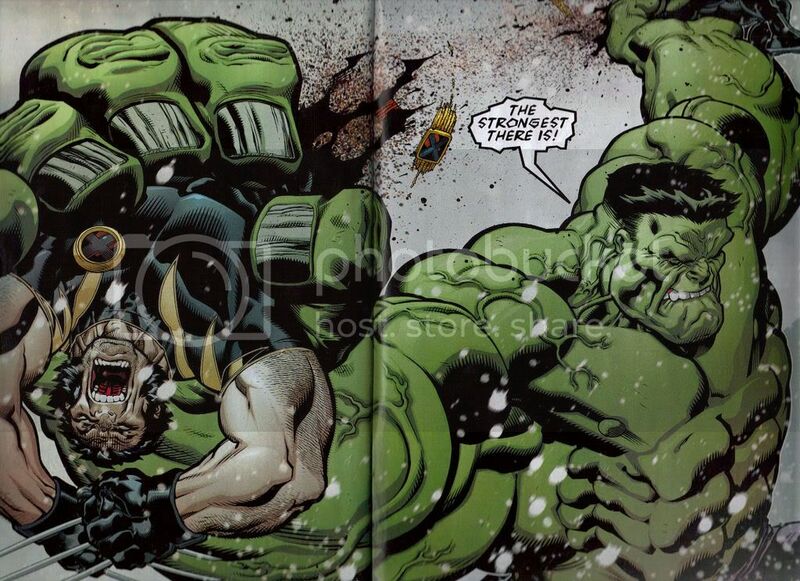 And as far as Ultimate Hulk vs Ultimate Wolverine, it's a cool shot but seeing how those involved still to this day have been unable to finish it, it doesn't hold a lot of weight with me. "In fact, Tony could send a suit an control it from somewhere else, he doesn't even need to be near Hulk to fight him. And who says he only uses one armor? He can control more than one at a time and even let some fight on autopilot. He can have an army of armors fighting Hulk. And seeing as he's already beaten Hulk while using only one armor, I'm sure he can do it with more. So like I said, I'm going with Iron Man unless Hulk's family is dead and he has obscene levels of rage which, judging from the glimpse of his fight with BB, is probably the case." Well if we start doing that then we have to take into account that he could throw the Thunderbolts and even the entirety of SHIELD after Hulk, as well as War Machine/Sentinel Prime ONE. Hes sending the population of a small country at the Hulk, but I still think Hulk could take them. I mean Hulk spent most of his life evading and defeating the Army. 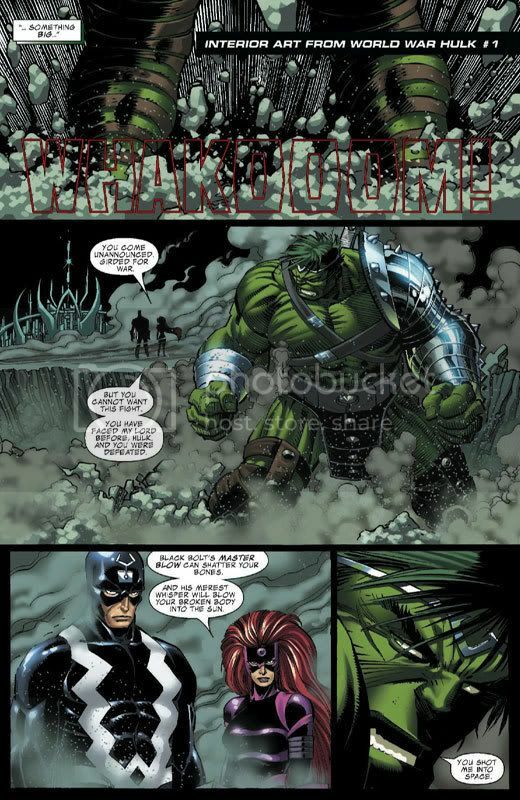 Also what I was saying about that picture was that it was Ultimate Hulk and Wolverine, and Mark Millar has made it possible for Ultimate Hulk to break admantium, 616 Hulk has never shown this ability. "Wolverine is the most overrated character in marvel. Sorry but I cant stand him. "It is, there are no un-coated parts of his spine. Wolverine's entire skeleton is covered with adamantuim. And I'll say it again, the Hulk took on Namor, Thor, Hercules, Iron Man and Wonder Man, and was kicking the $#@! out of em. The only reason he didnt kill them was becouse he got bored and left. Everything you said Buckshot is true, but your adding new dynamics and etting the fight up for Iron Man, who said Tony would send other suits to fight the Hulk?Its Hulk vs.Iron Man. And Hulk wins." Yes, Hulk has taken on all the Avengers at once, he's also been beaten by Iron Man one on one. To me, it could go either way. If Hulk is really pissed (like he will be), he wins regardless of what Tony does. I've said that already. But if Iron Man fights smart and actually used the powers he has instead of going in close for a fist fight like an idiot, he'd win against a Hulk. I'm not "setting up the fight for Iron Man". It's a viable tactic and since his powers now allow him to control his armor(s) mentally, without needing to be in them, it's not a stretch. I'm not talking about calling in help from others or anything. He has other armors and he can mentally call them into battle. It's like fighting Multiple Man. If he makes dupes to fight, that's not cheating, his powers allow him to do that. Iron Man's powers allow him to fight without being in the armor and or bring in more suits. How can Iron Man kill him? lololol. This is how its gonna go down. I hate Iron Man, but I'm really no big fan of the Hulk either. Hopefully they would kill each other. But something tells me Hulk would smash Drunk Man.